Today I’m sharing this Vintage Sleeping Bat Image! 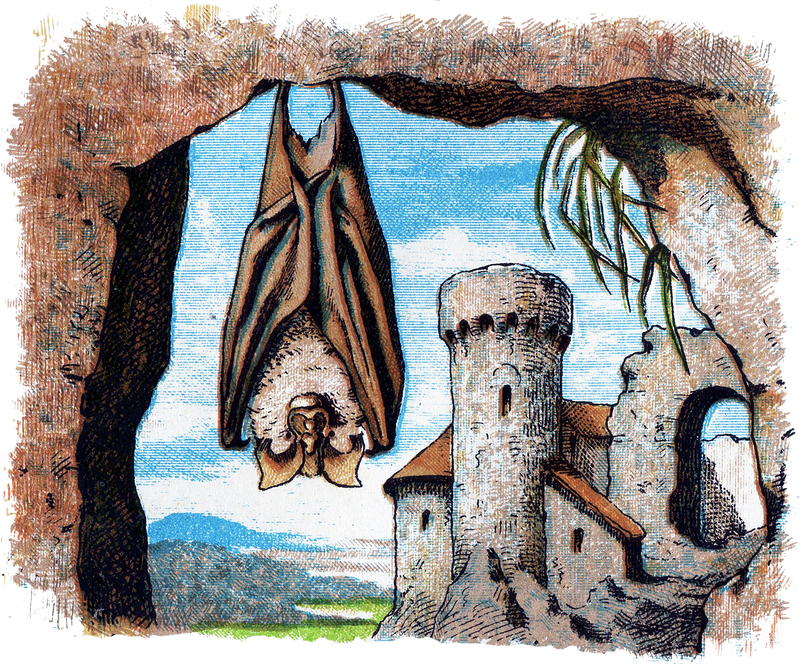 In this lithograph a large bat with brown wings gathered around him like a blanket hangs upside down from a cave opening. A stone castle with turret is in the background showing some blue sky and a landscape. So nice to use in your Halloween or Scary Craft Projects! Happy Halloween Cute Girl Holding Pumpkin Postcard! Vintage Adorable Child in Pumpkin Costume Image! Halloween Cat Image – Driving a Pumpkin Coach – Amazing ! « Old Camomile Flower Botanical Image! Great image, Karen! Thanks so much. You are so welcome Pat, glad you liked it! Loving the bats! I’ll be ready for Halloween 2018–I hope! This is a super bat image! Just found it! Perfect for my more “odd” pages!